In 2016, the AAA survey found that three-quarters of Americans reported feeling afraid to ride in a self-driving car. One year later, a new AAA survey found that their fear is unchanged. While the majority is afraid to ride in a fully self-driving vehicle, the latest survey also found that the majority (59%) of Americans are keen to have autonomous features in their next vehicle. This marked contrast suggests that American drivers are ready embrace autonomous technology, but they are not yet ready to give up full control. • Half (54%) of U.S. drivers feel less safe at the prospect of sharing the road with a self-driving vehicle, while one-third (34%) feel it wouldn’t make a difference and only 10 percent say they would feel safer. --Women (58%) are more likely to feel less safe than men (49%). 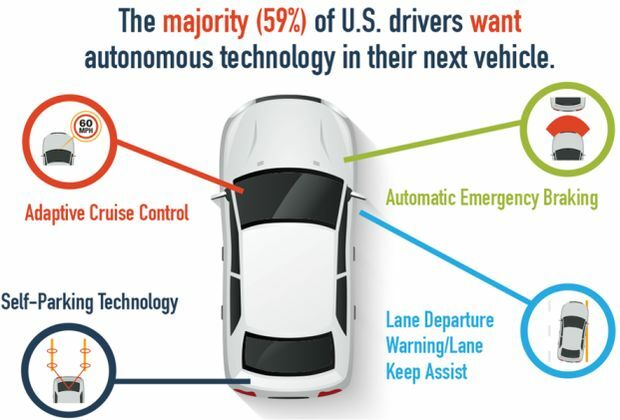 • The majority (59%) of U.S. drivers want autonomous vehicle technology in their next vehicle, while the remainder do not (25%) or are unsure (16%). --Millennials (70%) are the most likely to want the technologies, compared to Generation X (54%) and Baby Boomers (51%). • Three-quarters (78%) of Americans are afraid to ride in a self-driving vehicle. --Baby Boomers (85%) are more likely to be afraid than Millennials (73%) and Generation X (75%) drivers. --Women (85%) are more likely to be afraid than men (69%).